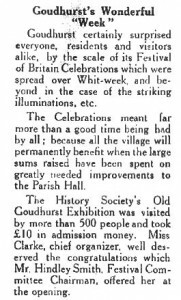 “Everyone is wondering what is going to happen in Goudhurst to celebrate the Festival of Britain. They are asking: (1) When is it to be held? (2) How long will it last? (3) Where will it be? (4) What is the idea? A committee was duly set up at a Public Meeting held on 9 March 1951. A leaflet was circulated by the new committee setting out their proposals for the celebrations and asking for support from associations and individuals in the parish. The idea was for a week of celebrations beginning with a church service on Whit Sunday, 13 May, and ending with a gala dance on Saturday, 19 May. The committee also invited residents in the village “to make preparations for decorating their houses and premises during the Festival Week, using every effort to make the occasion as gay as possible with floral displays, window boxes, and other decorations”. Funds raised during the celebrations would go towards the cost of adding a kitchen and other amenities to the parish hall “as an enduring memorial of the occasion”. The committee met on 14 March and began planning the event. They agreed that an advert should be placed in the local press inviting residents to submit their designs for a village sign. It was to be 5 feet by 3 feet and would be erected on the Plain. A prize would be given for the best design. The winner was Bridget Hayward, daughter of Kay Kendon of Curtisden Green, and blacksmith Jeffries of Hope Mill Forge made her sign. The following week the committee met again. This time they had invited representatives of the village organisations to meet with them to decide how they could be a part of the celebrations. By the end of the meeting a number of proposals and offers of help had been put forward and accepted by the committee. On 23 April the committee circulated a further leaflet detailing the proposed events throughout the Festival week and the expected costs involved. The committee had already been given a very generous donation of 300 guineas from The Ladies Wartime Pie Scheme. They expected to raise a further £200 from entrance fees and collections but this still left them £150 short of the £650 needed to carry out the proposed building works at the parish hall. The committee said they hoped that people would make further donations, however small, to help them raise the remaining £150. Mrs Kathleen Mackenzie, the well known writer for children, will explain the meaning of the Festival to the school children in the Parish Hall. The service, which will be held in St Mary’s Church, is a family service for all the People of Goudhurst and Kilndown, and for visitors. The fete will be held in the garden of “Maypole” and the parade of decorated vehicles will form up in front of the house at 6.30. The evening procession will also form up outside “Maypole” and will move off at 9.15. Full details including classes of entry, times and routes are given in a separate lucky programme issued by the organising bodies. 8.00 Cranbrook Amateur Dramatic Society will present THE CHILTERN HUNDREDS by William Douglas Home. (Tickets for a limited number of reserved seats are obtainable from Messrs W.C. Burgess & Son). 5.30 – 7.45 Special performances of the film “THIS HAPPY BREED” by Noel Coward. It is intended that the earlier performance should as far as possible be for the children, although adults unable to attend the later performance will be admitted. Tickets for a limited number of reserved seats are obtainable from Messrs W.C. Burgess & Son. Proceeds of these performances are being given to the Festival Fund by courtesy of Mr G. Hamilton. There will be snooker and table tennis matches, a shooting gallery, a nine tables whist drive, a running buffet and dancing from 10pm to music by Mr Harry Hodges. 7.30 WOMEN’S INSTITUTE FESTIVAL ENTERTAINMENT. Two plays: “The curse of Cairo” by Mabel Constanduros, and “Women at War” by E.P. Smith. Non-stop dancing to two bands. LESLIE MITCHELL the celebrated radio and television star has kindly consented to judge the fancy dresses, draw the winning numbers, and present the prizes. As well as the above programme, leaflets were produced for some of the individual events. Each was priced individually and some had lucky numbers on them with prizes for the winners. After the event, in his letter in the the Parish Magazine, the vicar said that the celebrations began on a high note when the church was filled to capacity on Whit Sunday. 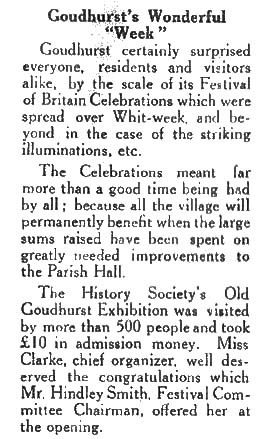 Another article in the magazine reported that Goudhurst had surprised everyone, residents and visitors alike, by the scale of their celebrations, in particular the striking illuminations. The History Society’s exhibition had been visited by more than 500 people and they had raised £10 towards the parish hall improvements fund. 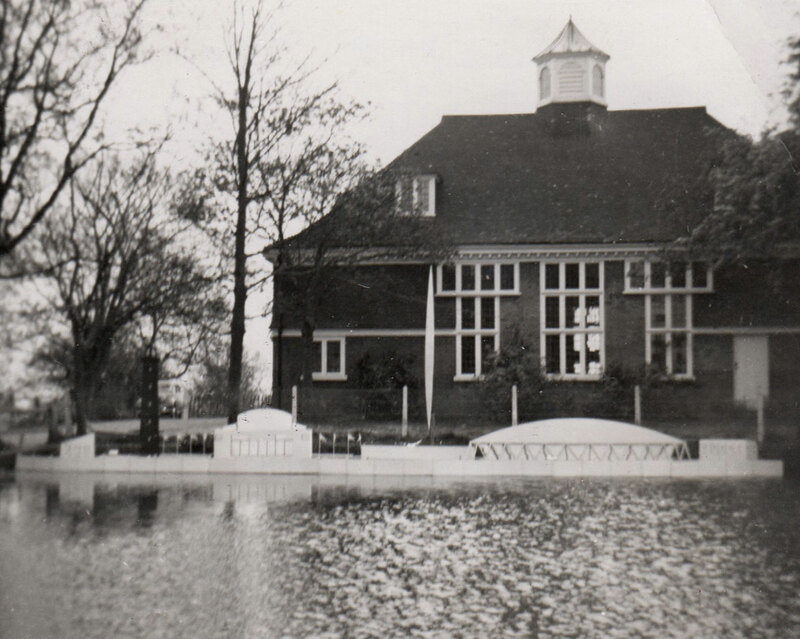 Additional events including a cricket match, a play, a tug of war and whist drives were planned for the summer to raise additional funds so that the planned works at the Parish Hall could go ahead.